The loss of a fetus at any stage is a fetal demise. According to the 2003 revision of the Procedures for Coding Cause of Fetal Death Under ICD-10, the National Center for Health Statistics defines fetal death as "death prior to the complete expulsion or extraction from its mother of a product of human conception, irrespective of the duration of pregnancy and which is not an induced termination of pregnancy. The death is indicated by the fact that after such expulsion or extraction, the fetus does not breathe or show any other evidence of life, such as beating of the heart, pulsation of the umbilical cord, or definite movement of voluntary muscles. Heartbeats are to be distinguished from transient cardiac contractions; respirations are to be distinguished from fleeting respiratory efforts or gasps." In the United States, the term stillbirth or fetal demise does not have a standard definition. For statistical purposes, fetal losses are classified according to gestational age. A death that occurs prior to 20 weeks' gestation is usually classified as a spontaneous abortion; those occurring after 20 weeks constitute a fetal demise or stillbirth. Many states use a fetal weight of 350 g or more to define a fetal demise. Although this definition of fetal death is the most frequently used in medical literature, it is by no means the only definition in use. Even within the United States, the differences in the definitions used are substantial. In addition, not all states interpret the weeks of gestation in the same manner. In California, 20 weeks' gestation is worded "twenty utero gestational weeks" and has therefore been interpreted to be 23 weeks from the last menstrual period. (Implantation in the uterus does not occur until 1 wk after fertilization.) Physicians must check the reporting requirements for the state(s) in which they practice. In 2006, data from the National Vital Statistics Report showed a US national average stillbirth rate of 6.05 per 1000 births, 3% lower than in 2005. Worldwide, this rate varies considerably depending on the quality of medical care available in the country in question and the definitions used for classifying fetal deaths. Underreporting in developing nations is common, which makes comparisons even more difficult. In 2009, the estimated global number of stillbirths was 2.64 million (uncertainty range, 2.14-3.82 million). The worldwide stillbirth rate declined by 14.5% from 22.1 stillbirths per 1000 births in 1995 to 18.9 stillbirths per 1000 births in 2009. History and physical examination are of limited value in the diagnosis of fetal death. In most patients, the only symptom is decreased fetal movement. An inability to obtain fetal heart tones upon examination suggests fetal demise; however, this is not diagnostic and death must be confirmed by ultrasonographic examination. Fetal demise is diagnosed by visualization of the fetal heart and the absence of cardiac activity. Once the diagnosis of fetal demise has been confirmed, the patient should be informed of her condition. Often, allowing the mother to see the lack of cardiac activity helps her to accept the diagnosis. Termination of pregnancy should be offered after diagnosis. Patient responses vary in regard to this recommendation; some wish to begin induction immediately, while others wish to delay induction for a period of hours or days until they are emotionally prepared. When a dead fetus has been in utero for 3-4 weeks, fibrinogen levels may drop, leading to a coagulopathy. This is rarely a problem because of earlier recognition and induction. In some cases of twin pregnancies, induction after the death of a twin may be delayed to allow the viable twin to mature. Early fetal demise may be managed with laminaria insertion followed by dilatation and evacuation. In women with fetal death before 28 weeks' gestation, induction may be accomplished using prostaglandin E2 vaginal suppositories (10-20 mg q4-6h), misoprostol (ie, prostaglandin E1) vaginally or orally (400 mcg q4-6h), and/or oxytocin (preferred in women with prior uterine surgery). Mifepristone 200 mg orally followed by misoprostol 400 mcg every 4-6 hours orally or vaginally appears to be the most efficacious and results in the shortest time to delivery. In settings in which mifepristone is unavailable, misoprostol alone is also highly effective. For women with a prior cesarean delivery after 28 weeks’ gestation, mechanical ripening can be performed with a Foley catheter, and induction can be continued with oxytocin. Pain management in patients undergoing induction of labor for fetal demise is an important part of patient care. Often, a morphine or hydromorphone patient-controlled analgesia device is sufficient for successful pain control. Should a patient desire superior pain control to intravenous narcotics, epidural anesthesia should be offered. The time following a fetal death is extremely difficult for both the family and the health care providers. In this stressful time it is important to ensure that the emotional needs of the family are met. A useful resource is a grief packet that can be given to the parents following the demise. This usually includes referrals for counseling, support groups, and other resources. A container or folder can be included so that the family can preserve keepsakes such as photos, footprints, or a lock of hair. Spiritual support is an important resource during such difficult times and should always be offered to patients and their families. Up to 60% of stillbirths have no identifiable etiology. Attempting to determine the cause of fetal death remains important because it may influence estimates of recurrence and future preconceptional counseling, pregnancy management, prenatal diagnostic procedures, and neonatal management. Many institutions use a selective workup based on clinical findings. For example, when clinical findings strongly suggest a cause for the fetal demise at Santa Clara Valley Medical Center, either no further testing or limited testing is performed. Causes deemed fairly obvious include cord accident (ie, prolapse, entanglement, true knot, tight nuchal cord), anencephaly, or previously known lethal karyotype. In such cases, no further workup is necessary. If severe clinical abruption is present, testing can be limited to toxicology screening and possibly a thrombophilia workup. The most important part of the workup of a fetal demise is the autopsy of the fetus. The decision to proceed with an autopsy must be made by the parents and informed consent is necessary. With parents who are resistant to the idea of a complete autopsy, a limited fetal evaluation should be discussed with the family. Although uncommon, postmortem MRIs can provide valuable information in the evaluation of a fetus when an autopsy cannot be performed. The placenta and the membranes should be carefully examined, including cultures. Again, an algorithm or checklist is helpful to avoid omissions (see image below). This inspection is even more important if the family declines an autopsy. 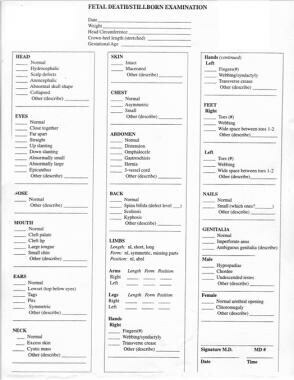 This is an example of a checklist to be used following fetal death. Courtesy of Santa Clara Valley Medical Center. The above tests have traditionally been a part of an evaluation for the etiology of fetal demise. If diabetes screening has been performed during the prenatal period, repeat testing for diabetes is probably not necessary. Similarly, if the patient has no signs or symptoms of thyroid disease, thyroid dysfunction is unlikely to be the cause of the demise. However, these tests are inexpensive and normal results may be reassuring to the patient. Laboratory tests for antiphospholipid syndrome: See Antiphospholipid Antibody Syndrome and Pregnancy. Infection: See Bacterial Infections and Pregnancy. Infection is a cause of fetal demise. The frequency is higher in developing countries. Autopsy and histologic evaluation of the placenta is probably the best way to document an infectious etiology for a fetal demise. Authority opinions vary as to which panel of tests is appropriate. Traditionally, most authorities have recommended obtaining TORCH (toxoplasmosis, rubella, cytomegalovirus, and herpes simplex virus) antibody titers. In reality, this is rarely helpful in the diagnosis. In addition, it is questionable whether cytomegalovirus virus causes fetal demise. If no obvious cause for the demise is established or if clinical signs or symptoms suggest infection, consider testing for (1) cytomegalovirus (acute and chronic titers), (2) rubella virus (acute and chronic titers, if not immune), (3) parvovirus (acute and chronic titers), and (4) Toxoplasmosis gondii (acute and chronic titers) and (5) syphilis. A more cost-effective approach is to limit testing for cytomegalovirus, rubella virus, and T gondii to those patients in whom clinical findings suggest the possibility of intrauterine infection (ie, those with intrauterine growth restriction, microcephaly). The following provides a summary of the current status of testing for fetal demise. This is adopted with permission from the work of Dr. Robert M. Silver and the Stillbirth Collaborative Research Network. This summary has been modified as more recent studies have become available. If a particular medical problem is identified in the mother, it should be addressed prior to conception. For example, tight control of blood glucose prior to conception can substantially reduce the risk of congenital anomalies in the fetus. Preconceptional counseling is helpful if congenital anomalies or genetic abnormalities are found. Genetic screening and detailed ultrasound can evaluate future pregnancies. In some cases, such as cord occlusion, the patient can be assured that recurrence is very unlikely. Fetal death of unknown cause is a special problem. Because a large number of etiologies of fetal demise exist, a provider has difficulty determining risk of stillbirth for any particular pregnancy. Evidence-based models such as Active Management of Risk In Pregnancy At Term (AMOR-IPAT) are being created in an effort to better estimate this risk. Although recurrent fetal loss is uncommon, patients are naturally anxious. Most patients find increased fetal surveillance with the next pregnancy reassuring, even though such testing is not clearly beneficial. The ACOG recommends antepartum testing starting at 32-34 weeks' gestation in an otherwise healthy mother with history of stillbirth. Weekly biophysical profile or fetal heart rate testing can be combined with maternal kick counts in the third trimester. For patients who have experienced earlier loss, frequent ultrasound is reassuring. Optimal management of chronic medical conditions is important prior to the next pregnancy. MacDorman MF, Kirmeyer S, Wilson EC. Fetal and perinatal mortality, United States, 2006. Natl Vital Stat Rep. 2012 Aug 28. 60(8):1-22. Cousens S, Blencowe H, Stanton C, et al. National, regional, and worldwide estimates of stillbirth rates in 2009 with trends since 1995: a systematic analysis. Lancet. 2011 Apr 16. 377(9774):1319-30. [Medline]. Tempfer CB, Brunner A, Bentz EK, Langer M, Reinthaller A, Hefler LA. Intrauterine fetal death and delivery complications associated with coagulopathy: a retrospective analysis of 104 cases. J Womens Health (Larchmt). 2009 Apr. 18(4):469-74. [Medline]. Borgatta L, Kapp N. Clinical guidelines. Labor induction abortion in the second trimester. Contraception. 2011 Jul. 84(1):4-18. [Medline]. Wildschut H, Both MI, Medema S, Thomee E, Wildhagen MF, Kapp N. Medical methods for mid-trimester termination of pregnancy. Cochrane Database Syst Rev. 2011 Jan 19. CD005216. [Medline]. Korteweg FJ, Erwich JJ, Holm JP, Ravisé JM, van der Meer J, Veeger NJ. Diverse placental pathologies as the main causes of fetal death. Obstet Gynecol. 2009 Oct. 114(4):809-17. [Medline]. Flenady V, Koopmans L, Middleton P, et al. Major risk factors for stillbirth in high-income countries: a systematic review and meta-analysis. Lancet. 2011 Apr 16. 377(9774):1331-40. [Medline]. Association between stillbirth and risk factors known at pregnancy confirmation. JAMA. 2011 Dec 14. 306(22):2469-79. [Medline]. Aune D, Saugstad OD, Henriksen T, Tonstad S. Maternal body mass index and the risk of fetal death, stillbirth, and infant death: a systematic review and meta-analysis. JAMA. 2014 Apr 16. 311(15):1536-46. [Medline]. Causes of death among stillbirths. JAMA. 2011 Dec 14. 306(22):2459-68. [Medline]. Gardosi J, Madurasinghe V, Williams M, Malik A, Francis A. Maternal and fetal risk factors for stillbirth: population based study. BMJ. 2013 Jan 24. 346:f108. [Medline]. [Full Text]. Reddy UM, Goldenberg R, Silver R, Smith GC, Pauli RM, Wapner RJ. Stillbirth classification--developing an international consensus for research: executive summary of a National Institute of Child Health and Human Development workshop. Obstet Gynecol. 2009 Oct. 114(4):901-14. [Medline]. [Full Text]. Reddy UM, Page GP, Saade GR, Silver RM, Thorsten VR, Parker CB, et al. Karyotype versus microarray testing for genetic abnormalities after stillbirth. N Engl J Med. 2012 Dec 6. 367(23):2185-93. [Medline]. Reddy UM, Page GP, Saade GR. The role of DNA microarrays in the evaluation of fetal death. Prenat Diagn. 2012 Apr. 32(4):371-5. [Medline]. Silver RM, Zhao Y, Spong CY, Sibai B, Wendel G Jr, Wenstrom K. Prothrombin gene G20210A mutation and obstetric complications. Obstet Gynecol. 2010 Jan. 115(1):14-20. [Medline]. ACOG Practice Bulletin No. 102: management of stillbirth. Obstet Gynecol. 2009 Mar. 113(3):748-61. [Medline]. American College of Obstetricians/Gynecologists. ACOG Practice Bulletin No. 111: Inherited thrombophilias in pregnancy. Obstet Gynecol. 2010 Apr. 115(4):877-87. [Medline]. Branch DW. The truth about inherited thrombophilias and pregnancy. Obstet Gynecol. 2010 Jan. 115(1):2-4. [Medline]. Werner EF, Lockwood CJ. Thrombophilias and stillbirth. Clin Obstet Gynecol. 2010 Sep. 53(3):617-27. [Medline]. Nicholson JM, Caughey AB, Stenson MH, Cronholm P, Kellar L, Bennett I, et al. The active management of risk in multiparous pregnancy at term: association between a higher preventive labor induction rate and improved birth outcomes. Am J Obstet Gynecol. 2009 Mar. 200(3):250.e1-250.e13. [Medline]. [Full Text]. ACOG Practice Bulletin No. 118: Antiphospholipid syndrome. Obstet Gynecol. 2011 Jan. 117(1):192-9. [Medline]. American College of Obstetricians and Gynecologists. ACOG Committee opinion. Perinatal and infant mortality statistics. Number 167, December 1995. Committee on Obstetric Practice. American College of Obstetricians and Gynecologists. Int J Gynaecol Obstet. 1996 Apr. 53(1):86-8. [Medline]. Barfield WD, Tomashek KM, Flowers LM, et al. Contribution of late fetal deaths to US perinatal mortality rates, 1995-1998. Semin Perinatol. 2002 Feb. 26(1):17-24. [Medline]. Chamley LW. Antiphospholipid antibodies: biological basis and prospects for treatment. J Reprod Immunol. 2002 Oct-Nov. 57(1-2):185-202. [Medline]. Copper RL, Goldenberg RL, DuBard MB, et al. Risk factors for fetal death in white, black, and Hispanic women. Collaborative Group on Preterm Birth Prevention. Obstet Gynecol. 1994 Oct. 84(4):490-5. [Medline]. de la Vega A, Verdiales M. Failure of intensive fetal monitoring and ultrasound in reducing the stillbirth rate. P R Health Sci J. 2002 Jun. 21(2):123-5. [Medline]. French AE, Gregg VH, Newberry Y, et al. Umbilical cord stricture: a cause of recurrent fetal death. Obstet Gynecol. 2005 May. 105(5 Pt 2):1235-9. [Medline]. Gomez Ponce de Leon R, Wing DA. Misoprostol for termination of pregnancy with intrauterine fetal demise in the second and third trimester of pregnancy - a systematic review. Contraception. 2009 Apr. 79(4):259-71. [Medline]. Gonen R, Lavi N, Attias D, et al. Absence of association of inherited thrombophilia with unexplained third-trimester intrauterine fetal death. Am J Obstet Gynecol. 2005 Mar. 192(3):742-6. [Medline]. Gross SJ, Phillips OP, Shulman LP, et al. Adverse perinatal outcome in patients screen-positive for neural tube defects and fetal Down syndrome. Prenat Diagn. 1994 Jul. 14(7):609-13. [Medline]. Heller DS, Rush D, Baergen RN. Subchorionic hematoma associated with thrombophilia: report of three cases. Pediatr Dev Pathol. 2003 May-Jun. 6(3):261-4. [Medline]. Hurtado V, Montes R, Gris JC, et al. Autoantibodies against EPCR are found in antiphospholipid syndrome and are a risk factor for fetal death. Blood. 2004 Sep 1. 104(5):1369-74. [Medline]. Hyde LK, Cook LJ, Olson LM, et al. Effect of motor vehicle crashes on adverse fetal outcomes. Obstet Gynecol. 2003 Aug. 102(2):279-86. [Medline]. Kochanek KD, Smith BL. Deaths: preliminary data for 2002. Natl Vital Stat Rep. 2004 Feb 11. 52(13):1-47. [Medline]. Many A, Elad R, Yaron Y, et al. Third-trimester unexplained intrauterine fetal death is associated with inherited thrombophilia. Obstet Gynecol. 2002 May. 99(5 Pt 1):684-7. [Medline]. Nohr EA, Bech BH, Davies MJ, et al. Prepregnancy obesity and fetal death: a study within the Danish National Birth Cohort. Obstet Gynecol. 2005 Aug. 106(2):250-9. [Medline]. Nybo Andersen AM, Hansen KD, Andersen PK, et al. Advanced paternal age and risk of fetal death: a cohort study. Am J Epidemiol. 2004 Dec 15. 160(12):1214-22. Nyman M, Skjoldebrand-Sparre L, Broliden K. Non-hydropic intrauterine fetal death more than 5 months after primary parvovirus B19 infection. J Perinat Med. 2005. 33(2):176-8. [Medline]. Ogunyemi D, Ku W, Arkel Y. The association between inherited thrombophilia, antiphospholipid antibodies and lipoprotein A levels with obstetrical complications in pregnancy. J Thromb Thrombolysis. 2002 Oct. 14(2):157-62. [Medline]. Perritt JB, Burke A, Edelman AB. Interruption of nonviable pregnancies of 24-28 weeks' gestation using medical methods: release date June 2013 SFP guideline #20133. Contraception. 2013 Sep. 88(3):341-9. [Medline]. Silver RM. Fetal death. Obstet Gynecol. 2007 Jan. 109(1):153-67. [Medline]. Silver RM, Varner MW, Reddy U, et al. Work-up of stillbirth: a review of the evidence. Am J Obstet Gynecol. 2007 May. 196(5):433-44. [Medline]. US Department of Health and Human Servies, Centers for Disease Control and Prevention, National Center for Health Statistics. Procedures for coding cause of fetal death under ICD-10. 2005. US Department of Health and Human Servies, Centers for Disease Control and Prevention, National Center for Health Statistics: Vital and Health Statistics. Perinatal mortality in the United States: Preliminary data for 2003. 2005. 53:15. Vintzileos AM, Ananth CV, Smulian JC, et al. Prenatal care and black-white fetal death disparity in the United States: heterogeneity by high-risk conditions. Obstet Gynecol. 2002 Mar. 99(3):483-9. [Medline]. Weiss HB, Songer TJ, Fabio A. Fetal deaths related to maternal injury. JAMA. 2001 Oct 17. 286(15):1863-8. [Medline]. The authors wish to thank Dr Robert M Silver and the Stillbirth Collaborative Research Network.